Yuki-Taro, AKA “the friendly snowbot” was publicly revealed in Japan back in 2007. This anthropomorphic snowplow came out of Japan’s Research and Development, Inc. (RDI) laboratory and production team. The robot is really cute~! It uses camera technology along side GPS coordinating tech to navigate streets. Intensely compacted igloo-style bricks come out of the back after being “eaten” by a mouth-like shovel area in the front. Americans might be surprised to learn there are parts of Japan where snow regularly falls. Snow is common in some parts of northern Japan where snowfall can block roads and isolate mountain villagers. 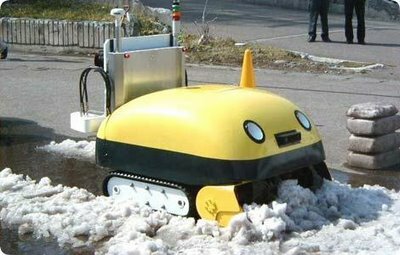 The idea of compressing snow into bricks of hard-packed ice-like material is unique to this robot and solves a long-standing problem of snow removal. Traditional snow removal devices like plows and snow blowers move drifts of snow around, sometimes creating inadvertent road blockage or other unsafe conditions. Several years have passed since it was introduced as a prototype but the device never really caught on because the world hates fun and because it uses a lot more energy than conventional snowplows.